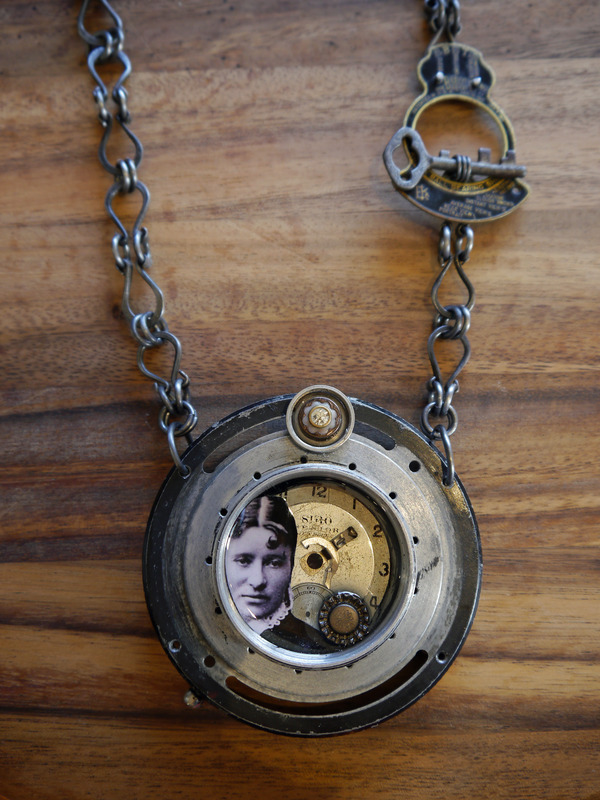 Vintage camera parts, watch face, vintage buttons, resin, key, photograph, steel (for the chain). Printed aluminium, silver jump rings, riveted (copper), cotton. I recently enjoyed a five day workshop with Anna Davern at TAFTA Forum (Geelong, Australia). The main technique was sublimation – transferring images onto plastic and metal (pre-coated with a thin plastic layer). 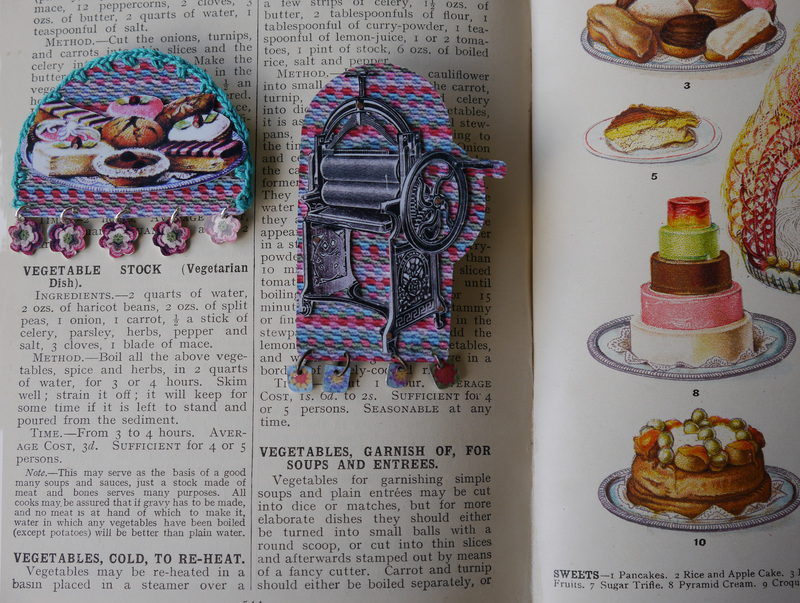 My inspiration was “Mrs Beeton’s All About Cookery” – my copy was given to my grandmother in 1909. Published in England, the recipes are intriguing – particularly the “Colonial and Foreign” section, which includes parrot pie for Australians and terrapin stew for “America and Canada” ! I love the pictures. Once scanned, printed and transferred to metal, the main pictures are cut out with a jewelers’ saw, then riveted to background pictures of crochet. The mangle picture is from an advertisment in the book for Champion mangles. “Ask your ironmonger for this particular mangle, accept no other“. 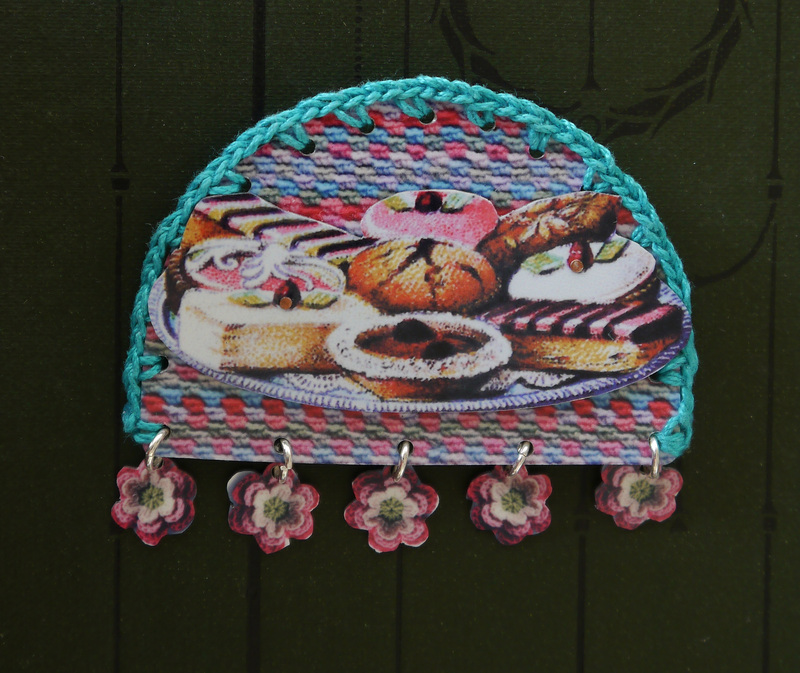 The small crochet motifs are also printed on metal – the cake pin is then finished with crochet cotton. Printed aluminium, silver jump rings, riveted (copper), crochet cotton (cake pin only).